With the massive success of the ‘Wonder Woman’ film at the box office (making nearly $400 million), the emphasis on the female gaze has never been more important. When we talk about the female gaze, it’s about having women in positions of agency and authority behind the scenes who can give voice to a more authentic representation of a female character on screen, on the page, and in front of the camera. In many ways it means female characters become multi-dimensional, complex, interesting, and flawed human beings, rather than a 2D version of what a male writer or creator may envision. Having Patty Jenkins direct the feature film was a huge part of its success. But before the film came about (took long enough! 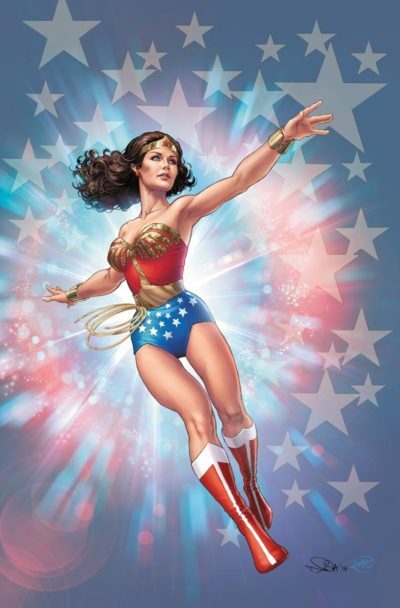 ), Wonder Woman has been living out her adventures in the DC comic book series. And you bet she has been given the female gaze treatment, thanks to illustrator Nicole Scott. The Australian-born artist only began her work in the comic book industry at age 30, but has been wasting no time gaining praise and accolades for her work from industry peers. USA Today named her one of the two best comic book artists of 2013 (the other also being a woman! ), and New York Times bestseller Tom Taylor says “there’s a reason she is where she is”. In a recent interview with W Magazine about her work, Nicola says she didn’t always set out to be a comic book artist, and spent time as an actress for film and theater before changing course. She was always a massive Wonder Woman fan, but a specific “ah-ha” moment led her to embark on a new creative endeavor. “I wished I could just draw Wonder Woman, because I always used to scribble her anyway—she was my first ever fictional character that I fell in love with…And then I realized, Oh my god, that’s a real job that exists, and a whole industry I hadn’t even really considered—I’m gonna do that. So that’s kind of where I launched myself, and after pursuing it aggressively,” she told W’s Stephanie Eckardt. Coming from Australia, Nicola explains how she hustled her way to working at one of the two biggest comic book companies in the world. Once in the US, she would network at places like San Diego Comic Con, ask lots of questions about the industry, until she landed a job drawing ‘Star Wars’ comics. Eventually her path led to DC, where she remained for over 10 years. 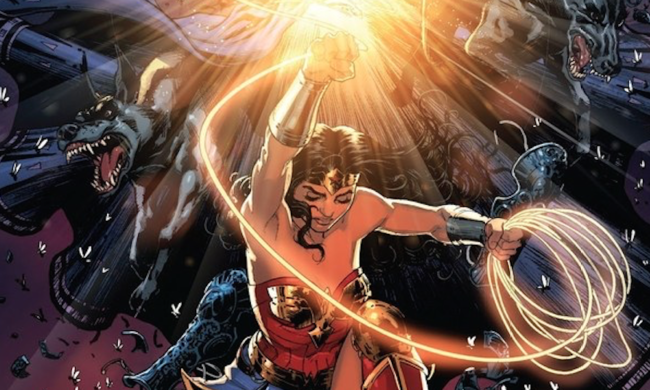 Nicola teamed up with writer Greg Rucka last year for DC’s ‘Wonder Woman’ revamp in time for the 75th anniversary, as well as in anticipation of the forthcoming film. It was a dream come true, especially for an Aussie girl who grew up watching the original TV series starring Lynda Carter and being blown away by how different this female character was to all others she saw. “There was this gorgeous, glamorous woman in this crazy outfit in taking charge who was throwing bad guys around and lifting up cars, and I was used to fairy tales and children’s books. It was so different that it struck me in the most significant way, and because of that, I’ve kind of judged every favorite female fictional character by her—it was just something I never grew out of,” she explained. No doubt this planted seeds of the importance of the female gaze, and today Nicola gets to be part of bringing that to fruition in her work. Reflecting on how this is affecting the film industry, she doesn’t hold back on her opinion of how slow Hollywood has been to featuring female superhero-driven movies. “There are some really fabulous interesting and complex female characters in the superhero realm now, and it’s a shame that the movies are just now starting to catch up. Marvel is 15 films in, and they still don’t have a female-led one. There’s one due down the pipeline, but she’s still not coming for a few years, so that’s sort of a little indicative of the people driving the ships,” she said, alluding to the importance of women in decision-making positions behind-the-scenes. While she may not be steering the on-screen version of Wonder Woman, Nicola has certainly been able to do this in her illustrations for DC. Her perspective on Diana Prince and her backstory is quite interesting to read, as she explains how the character has been misrepresented over the years, especially in relation to what fans know about some of the more popular male superheroes. “She’s an ambassador for peace, despite the fact that she’s one of the most highly skilled warriors in all of fiction. I think a lot of creatives over the decades have found it hard to justify those opposing concepts and found it hard to justify because she’s a female character, whereas if I were to break it down for male characters, she’s quite like a Jedi—someone highly skilled and highly trained, but really just trying to keep it calm,” she said. While she is capable of badassery, that is not the only thing that defines who she is, Nicola says. And it’s not just Wonder Woman she is giving the female gaze treatment to. 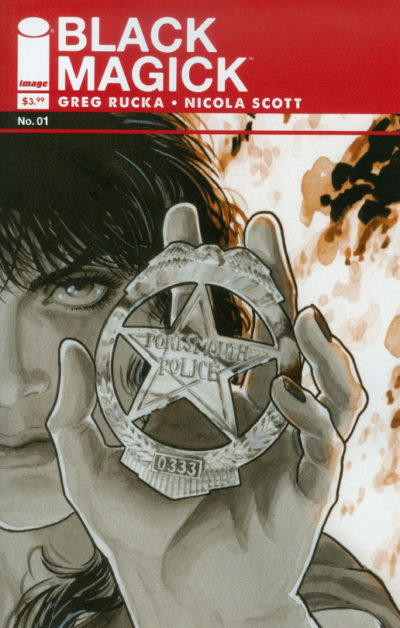 Nicola has a separate comic series project with Greg Rucka called ‘Black Magick’, an occult noir series about homicide detective who also happens to be a witch. The story is released in monthly installments, which you can read more about on the Tumblr account. She also likes to give male characters a female gaze-over, if you will, and recently re-imagined James Bond as a woman after the release of Charlize Theron’s ‘Atomic Blonde’ film (image below, animation by Alex Hodor-Lee). “As a female creator, every time I’m working on female characters, I’m very conscious of giving as much well rounded insight into the diversity amongst women. There’s been a lot of male writers and a lot of male artists in the history of comics,” she says, adding for every 3 types of male bodies generally used, there is usually one 1 female. “I’ve thought of it as sort of part of my job to give as many female body types as there are possible, to think of different kinds of female body language, to really flesh out the female characters and make them as diverse, if not sometimes more diverse, than the male ones. I will actively female gaze a lot of my male characters, as you can see in the Bond piece,” she said. Although the comic book world is still male-dominated, Nicole says the emergence of companies run by women, such as Los Angeles-based Emet Comics, are creating change. “When you look at the greater industry, outside of the two major superhero companies, there are a loads of female creators, writers, and artists working, and there always have been. It’s just now the smaller, more independent companies that are outside of superheroes are stronger than I think they’ve ever been—and there are a lot more women working in superheroes now, too. Here’s to more talented female creators bringing some much-needed female gaze into superhero characters and storylines!